This is one of my other favorite chicken dinners! This recipe is from 2002. I know that because my parents got the recipe while on vacation in Arizona when my daughter Elizabeth was just 12 weeks old. I remember that trip distinctly because Elizabeth ended up being in the hospital for four days while they were on that trip, and every time I make this meal, that’s what I remember! I’m sure having been on the actual trip, my parents probably have better memories than that, whenever they have this meal! This meal has very easy prep, but a long baking time, so take that into account when you’re planning. You have to start much earlier then you plan to actually eat. It can be served over rice or as you see it here, egg noodles, or whatever your prefer. My kids all like some part of this meal, whether it’s the chicken, the noodles, the artichoke hearts, the mushrooms or all of the above. That makes it a good one for our family. The only unique ingredients in the recipe are the sherry and the artichoke hearts. The sherry I almost always have on hand (Holland House Cooking Sherry) and the artichoke hearts I usually don’t, so I have to plan ahead and be sure to pick them up if I know I’m going to be making this. Nothing in this recipe is expensive so it keeps to our budget-friendly meal planning. One pan, one dish, I love it! You make the sauce in the same pan you cooked the chicken in. Makes for easy clean up. Sprinkle chicken with desired amount of salt, pepper and pakrika. Place 4 tablespoons of butter or margarine in large skillet. Brown chicken. When all chicken is browned, place in 9×13 baking dish. Add mushrooms. 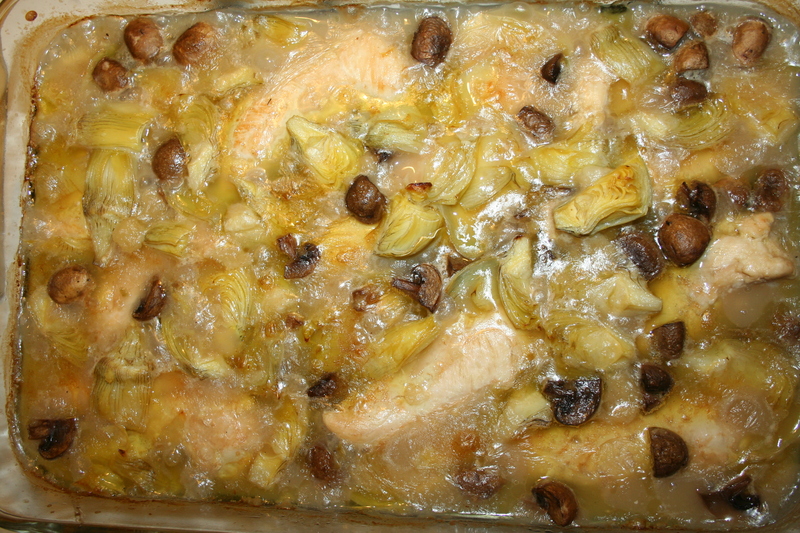 Drain artichoke heats and add to chicken and mushrooms in casserole. Add remaining 2 tablespoons of butter to skillet and melt over medium heat. Stir in flour until all flour is absorbed. Gradually add boullion and continue stirring until thickened. Stir in sherry. Pour sauce over chkcken, cover and bake at 375 for 45 minutes. Remove cover and bake additional 30 minutes. Finished and ready to serve!